Recommended to: Readers who love fantasy that immerses them in the world with great descriptions. Can I just start by saying that once again I'm blown away by the Indie author movement? It seems every time I turn my head, there's another fabulous self-published book for me to read. It just goes to show that it doesn't matter how it gets published, it matters how well it is written. Andor Awakening sated my recent deep need for some good, old-fashioned fantasy. You know the kind. A sweeping world, filled with small towns and bustling cities. Described beautifully so that you can almost see yourself walking down the cobblestone paths. A bloody war that is sweeping over the land. The epic battles, filled with an even amount of might and magic, that are a part of the aforementioned war. 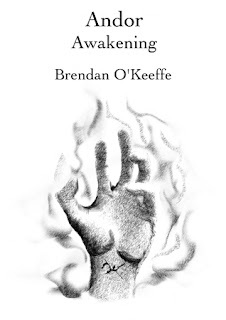 These are the things that keep me coming back to the fantasy genre, and Brendan O'Keeffe reminded me of all of that. I absolutely loved Andor and his companions. They are the epitome of what it means to be a warrior. Brave, strong, loyal. The type of people who I would be more than happy to have surrounding me. Written so perfectly, that I could picture them in my mind. Andor especially really shines in this story, which makes sense as he is the person we follow. Waking up with no knowledge of where (or who) he is, the reader tags along as he discovers his broken past and his uncertain future. To say that Andor is brave is actually a bit of an understatement. I won't spoil, but let's just say that the sheer determination he shows is enough to put him in my book of favorite characters. What really pushed me over the edge into loving this book were the perfect descriptions. You might have noticed that I opened up with that above. O'Keeffe knows just how to give you enough to keep you immersed in the world of Shae, without being overbearing. I found myself walking the same paths as the characters, cringing at the bloody battles that they faced, and even feeling my breath taken away when a perfect kiss ensued. Let's be honest. The most important part of a fantasy novel is feeling like you're a part of it. Andor Awakening will give you that. Despite a few minor grammatical hiccups, this book is also very well edited. You might catch them while reading, but I know that on my end it didn't hamper my enjoyment of the story. I am so thrilled to have found this new author and a new series to love! To all my fantasy loving friends out there, please go pick up a copy of Andor Awakening. You'll quickly find that you should have done it long ago.